I was drawn to this book for a few reasons - mostly because it is different from what I normally read. Since reading Picnic at Hanging Rock I've wanted to read more Australian literature. The Bookshop of the Broken Hearted is set in Australia and is by an Australian author. I also wanted to read different time periods since I mostly stick to the present day, 1920s, and 1940s. This novel takes place in the late 1960s and early 1970s. One of the first things I noticed about this book was the languid, almost lazy pace of the story. It was probably due to my having just finished the quite intense thriller Saving Meghan. It was a refreshing pace, without being boring. In fact, you knew that this would be a profound read and that you needed to savor each and every word. The Bookshop of the Broken Hearted would be the perfect book to read in a hammock with a glass of lemonade on a beautiful spring day. While this book is different from what I normally read, it wasn't a complete departure. Hannah, the bookshop owner, is a Jew from Budapest. She had survived Auschwitz, though none of the rest of her family did. There are a few chapters sprinkled throughout that are flashbacks to her past. I found Hannah to be an interesting character. Her disbelief in Tom, the main character, not knowing about Auschwitz or really much about the war in Europe. It parallelled my disbelief after having a conversation with an Indian that was unfamiliar with D-Day. But as Tom points out, their war was in the Pacific theater. And I've come to discover I know little about WWII in the Pacific. Also, I haven't read much about what happened to Jews after the liberation of the camps so it is interesting to see the continuing impact on her life. Another thing I found interesting about her is that she isn't truly anti-communism/anti-Soviet rule. There is mention of the Vietnam War and she did live for a time in Budapest under Soviet control. Her immigration to Australia seemed to have more to do with wanting to get away from the memories rather than oppression under communism. I liked Tom. He is well-liked by everyone and always willing to help others. He doesn't seem to be very ambitious. He does work hard, but it seems like he is keeping up the farm more out of some sort commitment to his late Uncle Frank, rather than to be successful himself. Though he is successful. He's happy with his life on the farm (or sheep station) with his woolies, blind horse, old dog, and orchards. He's happy until his wife leaves him. Then he is happy again when she returns, not so much because he's happy she has returned but rather because of the child she brings with her. He's not Tom's child, but that makes no difference to Tom. Being a good father is truly something Tom wants to succeed at. But I don't think he realized that until Trudy leaves again and eventually takes Peter with her. 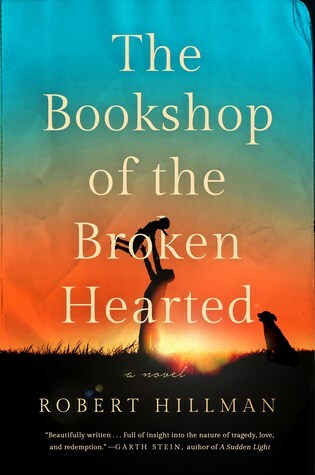 The Bookshop of the Broken Hearted is in turns about profound love and profound loss; grieving and healing. I think that this will be a book that I think about for years to come. It will be one of those books that will pop to the forefront of my mind when I least expect it but will provide insight into whatever the current situation is. I feel like a better person for having read this book. I think I would like this one. I'll have to add it to my list.